TRIBUTES have been paid to Jim Hosking of Fentongollan Farm who passed away on October 27th at the age of 76. 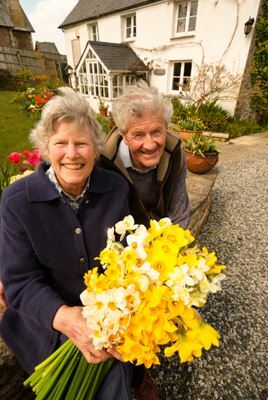 Jim was one of the UK’s leading daffodil growers and horticulturalists. He was a passionate advocate of all things Cornish and of the continuing importance of agriculture in the modern world and the research needed to sustain it. A man with an enormous enthusiasm for life, he was involved in many organisations including the Royal Agricultural Society of England, the Royal Cornwall Agricultural Society and the City of Truro Choir. He will be sadly missed by his family, work colleagues and so many people across the UK who attended his memorial service that filled Truro Cathedral. His son, James Hosking, said: "He was a total gentleman with an enormous circle of friends. He was completely enthusiastic about everything he did, for his family, for the county, for agriculture and for the local community." Jim first fell in love with Fentongollan Farm, part of the Tregothnan Estate when he was evacuated there during the Second World War to live with his uncle. He met his future wife while studying at Seal Hayne agricultural college. He leaves his widow Jill, four children and eight grandchildren.